Purchase orders are valuable, practical documents that help keep agencies organized (and invoices accurate). 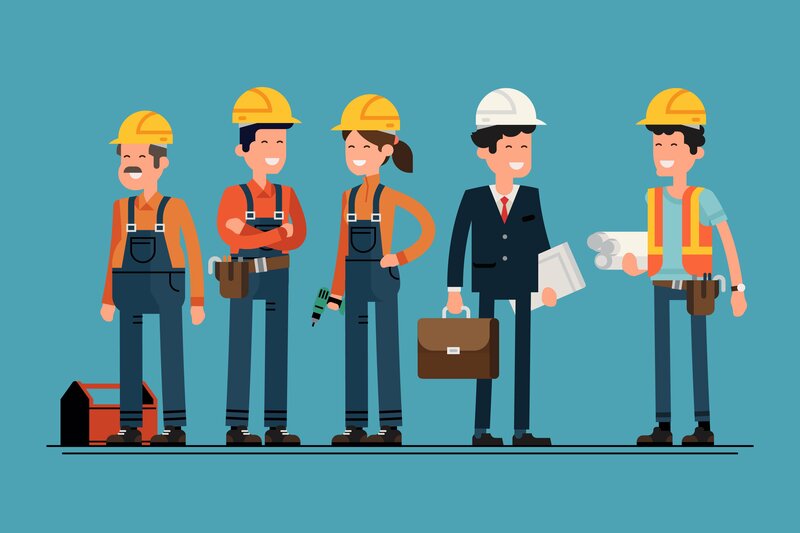 When working on a project that requires the use of outside vendors, it’s a good idea to keep records of what is being ordered, the cost of materials and the status of delivery. 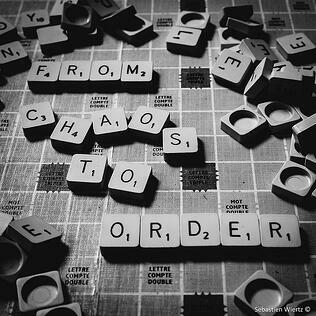 The same rules apply if you are in charge of ordering office supplies for the agency. 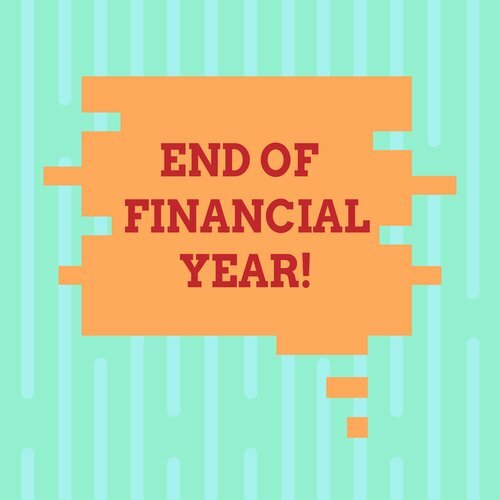 However, the thought of incorporating yet another process can seem daunting, especially given the amount of work already piled on your plate. Since you can’t exactly skip this task, we found a way to streamline the process to help you save time and energy. 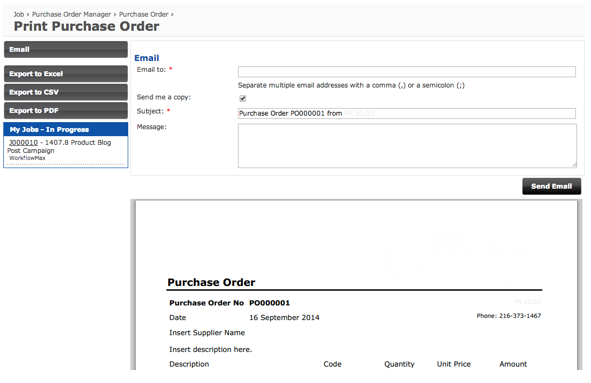 Below, we’ve outlined the five simple steps to create a purchase order using WorkflowMax. Within WorkflowMax, you can create a purchase order by scrolling over the “Financial” tab at the top of the header, and selecting “Purchase Order Manager” from the dropdown menu. 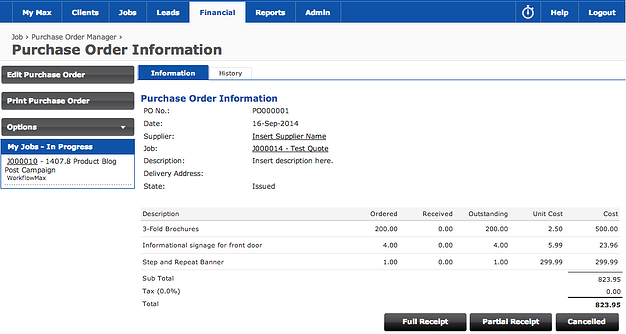 From the Purchase Order Manager window, click “New Purchase Order,” located on the left side of the screen. 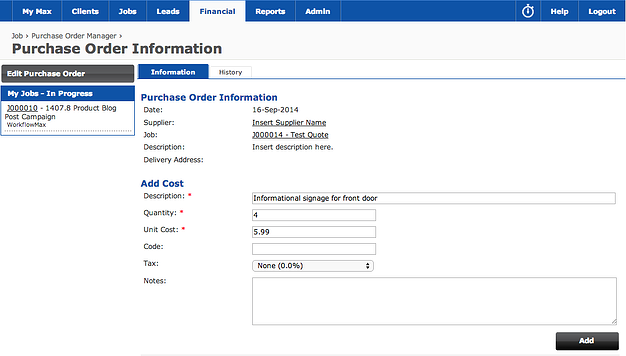 Once you’ve filled out the purchase order information, you can begin inputting the cost, quantity, tax and codes for the items associated with the purchase order. 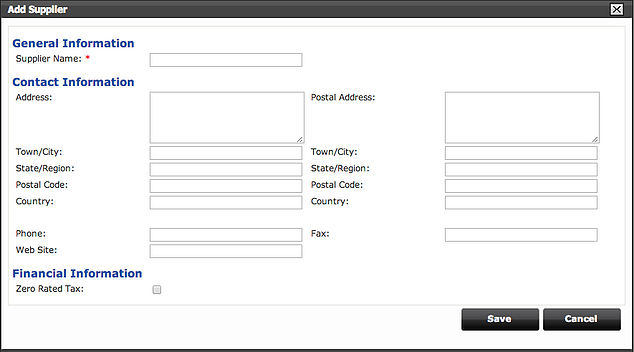 When you’ve finished inputting the details of each item for the purchase order, save it as a draft. To review the draft prior to finalizing and sending, go to the “Purchase Order Manager” section of your WorkflowMax account. Again, this can be found by scrolling over the “Financial” tab at the top of the header, and selecting “Purchase Order Manager” from the dropdown menu. If you are satisfied with the appearance of the quote, hit “Issue & Print” to create a PDF that you can email, or print and mail to the supplier. Finally, you can update the status of the purchase order—Full Receipt, Partial Receipt or Cancelled— depending on the items received from the supplier. Full Receipt: If the supplier fulfills every item indicated in your purchase order, select this option. Partial Receipt: If the supplier only delivers part of your overall order, select this option. Update the information fields by indicating the number of items received, which will automatically update the number of items that are outstanding. 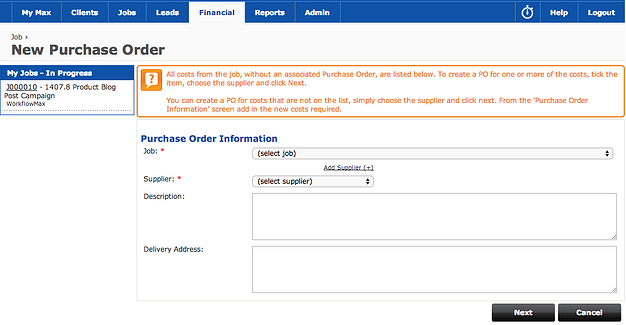 You can also add additional items to the purchase order with this option. Cancelled: If you choose to cancel the purchase order, select this option. WorkflowMax will delete this purchase order from your Purchase Order Manager. 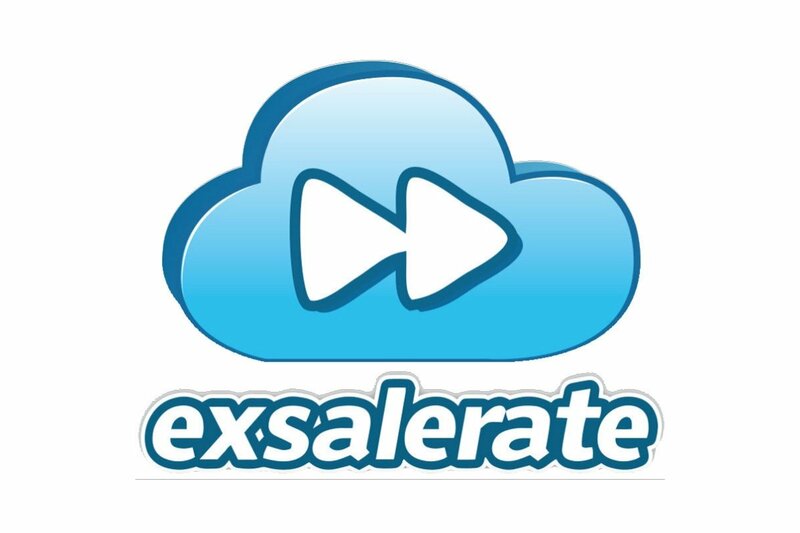 For more information on how to develop, revise and issue purchase orders, check out the full demonstration video here. How do purchase orders help your agency operate more efficiently? Please share in the comments section below.